Safety Score: 4,4 of 5.0 based on data from 9 authorites. Meaning please reconsider your need to travel to Venezuela. 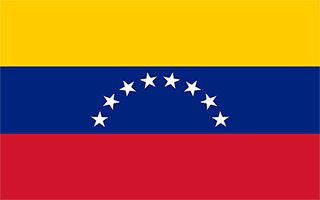 Venezuela with its capital Caracas is located in South America (Northern South America, bordering the Caribbean Sea and the North Atlantic Ocean). It covers some 912,051 square kilometers (almost six times the size of Georgia) with a population of 31,304,000. Spanish is the language spoken by the majority in Venezuela. Brazil, Colombia and Guyana are bordering countries. Venezuela is a country in South America. Having a shoreline along the Caribbean Sea and the North Atlantic Ocean, Venezuela borders Colombia to the west, Guyana to the east and Brazil to the south, and is situated on the major sea and air routes linking North and South America. The Angel Falls (Churun Meru) in the Guiana Highlands is the world's highest waterfall and one of Venezuela's major tourist attractions. To reach someone Venezuela dial +58 prior to a number. The local cellular networks are operated on 850 MHz, 900 MHz, 1800 MHz, 3G, 4G. Websites typically end with the top level domain ".ve". If you want to bring electric appliances (e.g. battery chaarger), keep in min the local 120 V - 60 Hz (plugs: A, B). The sign for the locally used currency Bolivar is VEB. Three equal horizontal bands of yellow (top), blue, and red with the coat of arms on the hoist side of the yellow band and an arc of eight white five-pointed stars centered in the blue band; the flag retains the three equal horizontal bands and three main colors of the banner of Gran Colombia, the South American republic that broke up in 1830; yellow is interpreted as standing for the riches of the land, blue for the courage of its people, and red for the blood shed in attaining independence; the seven stars on the original flag represented the seven provinces in Venezuela that united in the war of independence; in 2006, then President Hugo CHAVEZ ordered an eighth star added to the star arc - a decision that sparked much controversy - to conform with the flag proclaimed by Simon Bolivar in 1827 and to represent the historic province of Guayana. Venezuela was one of three countries that emerged from the collapse of Gran Colombia in 1830 (the others being Ecuador and New Granada, which became Colombia). For most of the first half of the 20th century, Venezuela was ruled by generally benevolent military strongmen who promoted the oil industry and allowed for some social reforms. Democratically elected governments have held sway since 1959. Under Hugo CHAVEZ, president from 1999 to 2013, and his hand-picked successor, President Nicolas MADURO, the executive branch has exercised increasingly authoritarian control over other branches of government. At the same time, democratic institutions have deteriorated, freedoms of expression and the press have been curtailed, and political polarization has grown. The ruling party's economic policies have expanded the state's role in the economy through expropriations of major enterprises, strict currency exchange and price controls that discourage private sector investment and production, and overdependence on the petroleum industry for revenues, among others. Current concerns include: human rights abuses, rampant violent crime, high inflation, and widespread shortages of basic consumer goods, medicine, and medical supplies.